2-Stage Big Blue 10 Whole House System+ Bracket+ Sediment+Carbon Block Filters. 1 OF AQUABOON 10 BIG BLUE WHOLE HOUSE FILTER HOUSING. This premium 10 whole house filter housing offers the flexibility to meet all of your large capacity filtration needs, including high-flow and heavy-sediment applications. The big blue housing allows for greater cartridge capacity, reducing the number of vessels required for high-flow-rate applications. This 10 Big Blue filter housing with pressure release button is suitable for high-flow and heavy sediment applications. The opaque blue sump is made of reinforced polypropylene for strength and resistance to chemicals, and the black cap is made of high-flow polypropylene (HFPP) for stiffness. The black cap has 1 female National Pipe Thread Taper (NPT) threaded input and output connections and an O-ring to ensure a watertight seal. A pressure relief button on the inlet side of the cap releases pressure in the housing for changing filter cartridges. Blue 10 full flow size housing. Accepts 10 x 4.5 cartridges. Rated for pressures up to 90PSI (6.20 bar). Rated for temperatures up to 125°F (52°C). 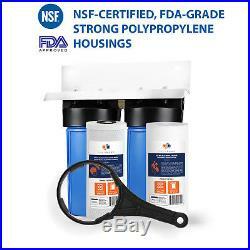 Made from FDA grade polypropylene. Type: 10 Full Flow. Pipe size: 1 NPT. Pressure Release Button: Yes. CAUTION: If you suspect your water pressure will at any time exceed 80PSI, a pressure regulator must be installed! This premium whole house filter housing is usually placed in the main water line entering the house and generally has capacities to filter up to 100,000 gallons of water before you have to replace the cartridge. In addition, it also protects your appliances, fixtures and pipelines. Can be connected 2-3 housings in a series to create a custom solution for your water needs. For example, add a sediment filter in the first housing, then followed by a carbon or iron removal filter in the second housing for two-stage filtration. 1 OF AQUABOON 5 MICRON 9.75 x 4.5 BIG BLUE CARBON BLOCK FILTER CARTRIDGE. Activated carbon block is a blend of fine activated carbon, water, and a suitable binder that is mixed and molded then hardened or extruded to a cartridge filter of any size and shape. Carbon block is made of fine coconut shell removing chlorine, odors and tastes of many organic and chemical compounds, at the same time it offers a much finer filtration of suspended particles and dirt. Class 1 Chlorine, Taste & Odor Reduction. Made with Premium Quality Coconut Shell Activated Carbon. No Release of Carbon Fines. Fits all Standard 10 Big Blue/Full Flow Filter Housings. Dimensions: 10 x 4.5. 10,000 Gallon Capacity. Flow rate: 3 GPM. Operating Temperature: 39°F125°F (4°C52°C). Cartridges are individually shrink wrapped. Lifetime: Replace once or twice times a year, depending on the water quality. 1 OF AQUABOON 5 MICRON 10″ X 4.5″ BIG BLUE SEDIMENT WATER FILTER CARTRIDGE. Sediment filter is made of fine melted polypropylene, which is blown and spun in a cylinder-like form. The main function of sediment filter is to remove large and fine particles from a drinking water, such as sand, dirt, silt, and rust particles. These filters have graded density layers, meaning the outer layers are more porous, catching larger particles, while the inner layers are a finer micron. Each cartridge is individually shrink-wrapped. Lifetime: Replace two or three times a year, depending on the water quality. Flow rate: 5 GPM. Filter life: 10,000 gallons. Operating Pressure: 60 psi. Removes dust, particles, and rust. Good for water filters and aquariums. Whole House Sediment Filtration. Food & Beverage Industry. Plating and Agricultural Industry. 2-Stage Whole House Filtration System by Aquaboon (Carbon+Sediment Filters). 3-Stage Whole House Filtration System by Aquaboon (Carbon+ 2 Sediment Filters). Our mission is to provide the highest quality of service and products in the water treatment industry. Therefore, through our commitment, our customers can be assured that their future filter requirements will be fully met with state of the art solutions. The item “2-Stage Big Blue 10 Whole House System+ Bracket+ Sediment+Carbon Block Filters” is in sale since Tuesday, October 25, 2016. This item is in the category “Home & Garden\Kitchen, Dining & Bar\Small Kitchen Appliances\Water Filters”. The seller is “filterway” and is located in Oceanside, New York. This item can be shipped worldwide. Filter Size:: 10 x 4.5 Inch.